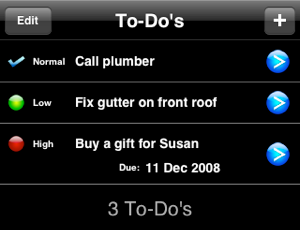 To-Do’s is an application for the iPhone and iPod touch that lets you keep track of important tasks and information. Whether it’s remembering what meal you’re cooking tonight or that you need to buy your friend a birthday present, To-Do’s is there to remind you. With an intuitive and pleasant user interface, along with useful and logical features, To-Do’s is a great app you’ll want to keep on page 1 of your home screens. Version 1.1 is here! Check out the great new features including due dates, sorting and more! Here you can see three to-dos. On the left you can tell how each is prioritised. 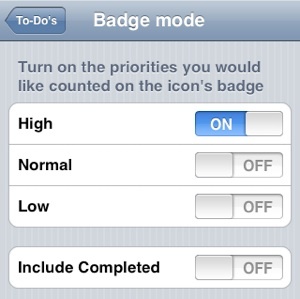 A green light indicates low priority, an amber light indicates normal priority, and a red light indicates high priority. To avoid confusion, the priority is also written next to the light. 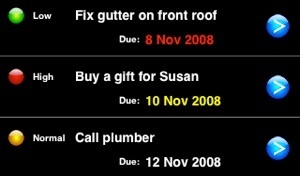 If a to-do has been completed, it’s priority light is replaced by a blue tick. This helps you see which tasks you have already completed and which have yet to be done. 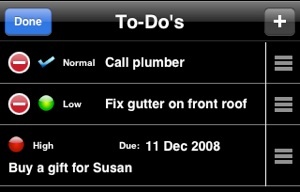 A truncated version of the text of the to-do is shown in the centre of the row. 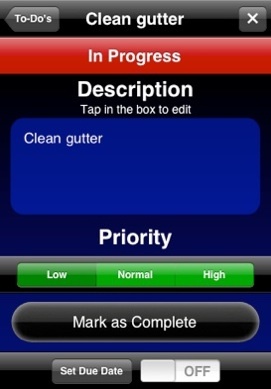 If a due date has been set, it will appear next to the priority light and the text will be moved to the line below. Here you can see the status of the to-do in the coloured bar. 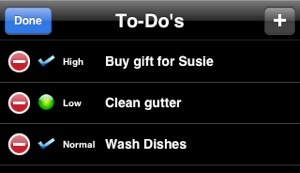 To go back to the list simply tap of the “To-Do Items” button on the top black bar. Tapping on “Yes” will delete the to-do and return you to the to-do list. Tapping on “No” will leave the to-do in the list and mark it as “Complete”. Tapping on the cross in the top right of the screen will also ask you if you wish to delete the to-do without having to alter the status. The keyboard will slide up and you will be given two new buttons on the coloured bar, which turns blue when you are editing the text. 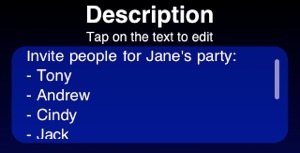 The “Clear Text” button, as you would expect, deletes all the text from the box. This can be reversed if you accidentally tap it as it becomes an “undo” button until you type again. The keyboard supports error correction and prevention just as in Mail, and most other apps that use the keyboard to type text. Just as in those, to accept the suggested word (“Tuesday” shown here) simply tap the space bar. 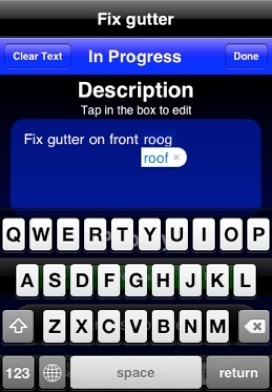 To leave the word as you typed it tap the suggested word. Once you are done editing tap “Done” to leave text editing mode and hide the keyboard away. Remember that you can type as much text as you need, and can even use return characters to type a list. 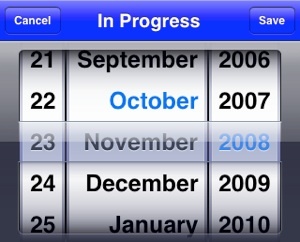 The due date will be saved in case you want to use it again, but you will no longer see the due date in the list view. Tapping on the red circle on the left will cause the “Delete” button to appear on the right. 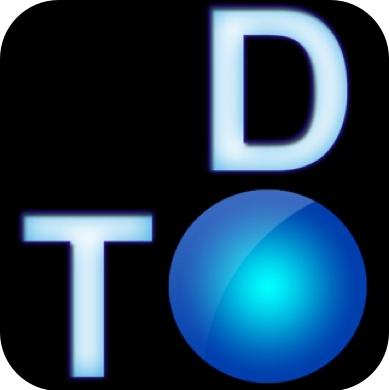 Tapping on the “Delete” button will delete the to-do. You might notice that there is no red delete circle next to the first to-do in the list. This is because it is a high priority, incomplete to-do. If “Safe Delete” is turned on in Settings, you can only delete these by going into their details page. This helps prevent accidental deletion of important to-dos from the list view. The first settings you can control are general features including displaying larger fonts for people who have difficulty reading, and Safe Delete mode. 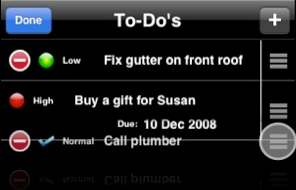 When this is turned on, high priority, incomplete to-dos cannot be deleted from the list view. If you choose any of these other than Manual, the list will be sorted automatically for you the next time you launch To-Do’s, and will stay in the correct order you chose. If you choose Manual, the next time you launch To-Do’s the list will be in the same order as it was the previous time you opened it. However, you will now be able to sort the to-dos yourself. 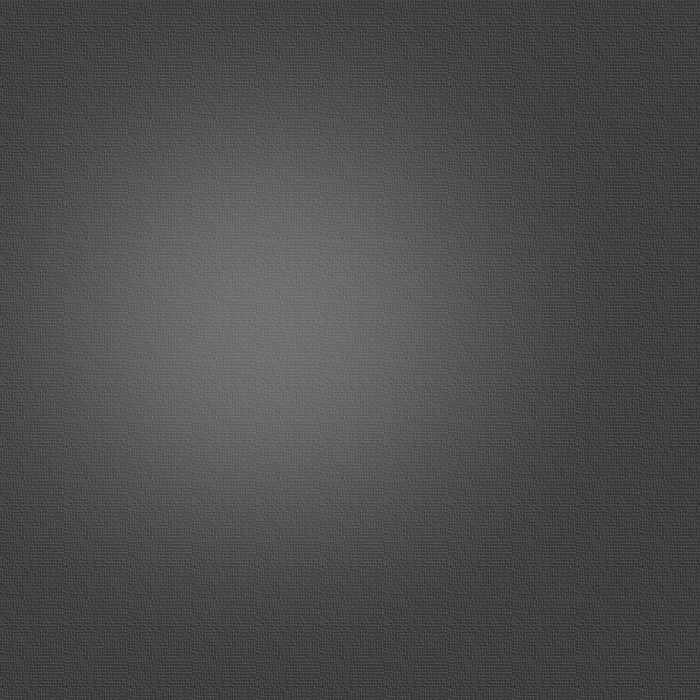 Once you are finished tap done to leave edit mode.